In the 43 years we’ve been together and especially the almost 28 years we’ve been in this house we’ve accumulated a lot of stuff. Some of the stuff we love, some of the stuff we don’t love. Some of the stuff is useful, some of the stuff we’ve forgotten we ever had. This is not a good state of affairs. Recently I’ve been moved to start (another) big sift and sort, and I’ve given away all sorts of things. STOing, we call it here (Sorting Things Out). Because in the big scheme of things there is no ‘away’, wherever possible I’ve passed things on to someone else, in the hope that they will enjoy them or at least find them useful. Some things have made their way to where they probably should have gone a long time again – the recycling boxes. All those greetings cards I thought I might make use of long after the celebratory day had passed? I had accumulated more than I could use in several lifetimes. They’ve gone to the card recycling. In future I hope I may find a better place for them (maybe a local craft group that uses them to make new greetings cards to sell as a fundraiser?). In future I will (try hard to) be more discerning about which ones to keep – I have still held onto several that I am confident I will use, and some with great sentimental value (to me). When I counted up, we had far more wooden spatulas and wooden spoons than is reasonable or sensible for a household of two people. Many are now in the culinary purgatory that is our garage, and will, I don’t doubt, eventually be on their way to a charity shop (or maybe to a charity that gives people being newly housed the makings of a kitchen?). It all started with my desk. 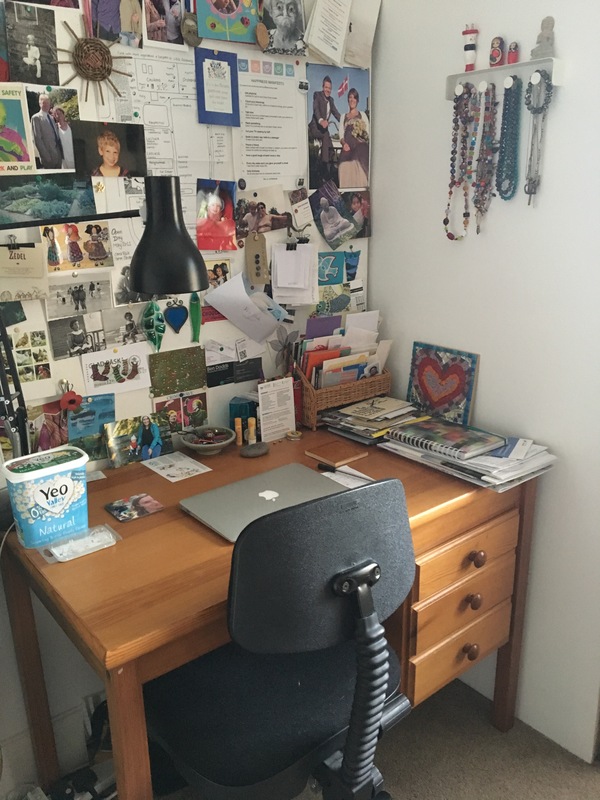 No photo to show you, but I’m betting you don’t need me to show you a desk overflowing with papers and things to be dealt with – you probably have had one yourself at some time. There was no alternative – papers desperately needing to be dealt with but first I had to find them – no option but to sort and sift the heaps. It took me just an hour to sort and tidy my desk. Quite a lot went straight in the recycling or pile for shredding. The things that needed to be done urgently stayed on top of a much-reduced pile. Over the course of the next week I managed to do all the urgent things. I have kept my desk tidy (two weeks on now…). And somehow the satisfaction of doing that has spurred me on to rummage through drawers and cupboards and shelves all over the house. There’s no stopping me at the moment. Useful or beautiful? let’s keep it. Neither of those? it goes. Eating the elephant one bite at a time. Metaphorically speaking. Two almost untouched and almost ancient tubes of herbal medicinal cream (witch hazel and tea tree; arnica) have now been happily passed on to another local Freegler. A bag of bits and pieces (jewellery, scarves, a belt) have gone to the local hospice charity shop. A bag of unused electrical cables was gratefully received by another local charity shop. 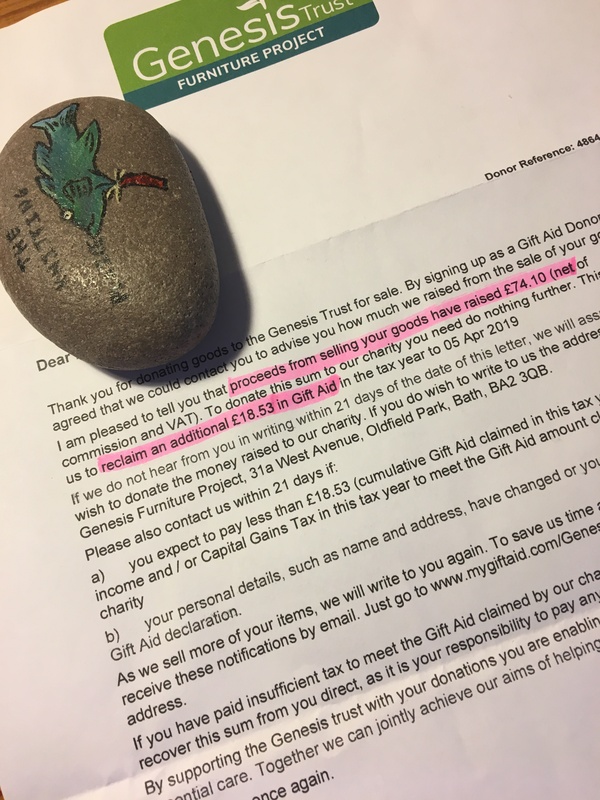 A reminder of the good this can do arrived in the post this week – a letter from the charity we gave an old sofa-bed and armchair to. They raised just over £90 by selling them. Someone now has the benefit of having bought relatively cheaply furniture we weren’t using, the charity has the money to use for the services they provide for local homeless and vulnerable people, and we have the space for something else. Win-win-win. Among the last to be tackled will be my fabric and yarn drawers. But their time will come. Oh yes indeed. In my mind’s eye I see some quilts and other things emerging. Watch this space. This entry was posted in Climate change, Community, Do what you can with what you have, Frugal, Uncategorized and tagged Community, Frugal, reduce reuse recycle, Simplicity. Bookmark the permalink.